So far we've been considering Rest queries to be discrete. In this section we are going to build a complete application that regularly collects data from multiple places and reports on it. Try it out first ? These are enhancements to Data Manipulation Classes so they have been included in cDataSet.xlsm, which is downloadable from Download Complete Projects. Note: Tweetsentiments.com has withdrawn free access to it's API. This example has been removed from the example workbook for now. 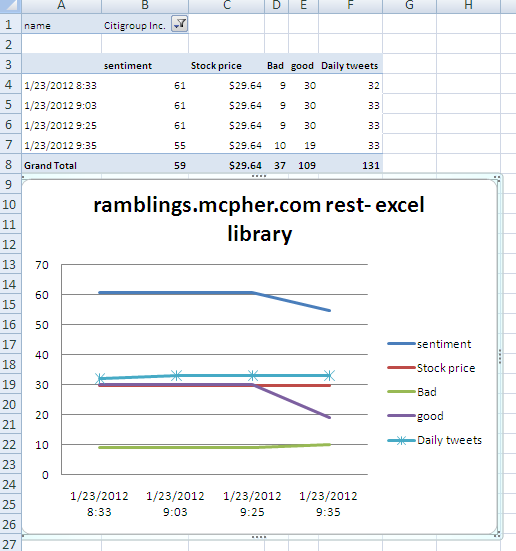 Using tweets and sentiments to compare with stock price. In this example we are going to take a look at how to query tweetsentiments, topsy and Google Finance on a scheduled basis, populate a spreadsheet with the results, and track changes over time. Starting from a stock ticker, we can look up the current stock price on Google Finance, use Tweetsentiments to see the sentiment at a point in time, and use topsy to count the moving average of tweets for a given day at a given time. These things together might (or might not) show a correlation between sentiment and stock price. Here is the combined table we are going to create at regular intervals. For this I've picked some random stocks to track. It's a little hard to read, but I'll take you through the details in the following sections. The first part of the process is to fill in a few pieces of data from a rest query to Google Finance, using the ticker as input. The current stock price is in the column marked 'l'. 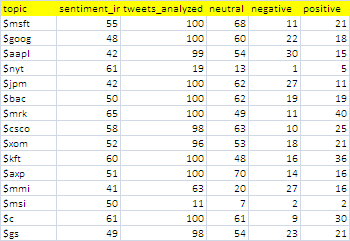 Next, we'll take the current tweetsentiment using the ticker for each stock. It is standard practice to use $ticker on twitter when making stock price tweets. It may be that it's worth querying on the company name as well to look for general sentiments about a company, but for this illustrative example, let's use $ticker. We can use topsy to find out the volume of tweets on a particular, topic - in this case $ticker for each stock being tracked. We'll add a timestamp to each row, so that we can analyze these over time later. Since we want to track this over time, we'll automatically run this every now and again, and build up a backlog of data to create a chart over time, and refresh that with every update. There is nothing new here that hasn't been covered elsewhere in the Rest to Excel library, but here is how to put all this together. Run all the queries, move the collected data to a growing repository and update any charts. Execute the whole process and schedule the next one. After each scheduled query set, the collected data is moved to a repository for later analysis. Again, the Data Manipulation Classes do most of the dirty work. Since we want this to be automatic, we will use a named Dynamic range for the reporting pivot table and chart, defined as follows. Note that this is an example to illustrate the technique - not a research project - maybe you could use the tools here and devise something more scientific. If you do find a correlation, we'd love to hear about it on the ramblings forum. Occasionally you will get some error like 'forbidden - rate limit exceeded' - since the access to topsy and tweetsentiments are sometimes throttled. This can likely be fixed by waiting a moment between each query. I haven't experimented with that yet for the purposes of this example. In the meantime why not join our forum, follow the blog or follow me on twitter to ensure you get updates when they are available .